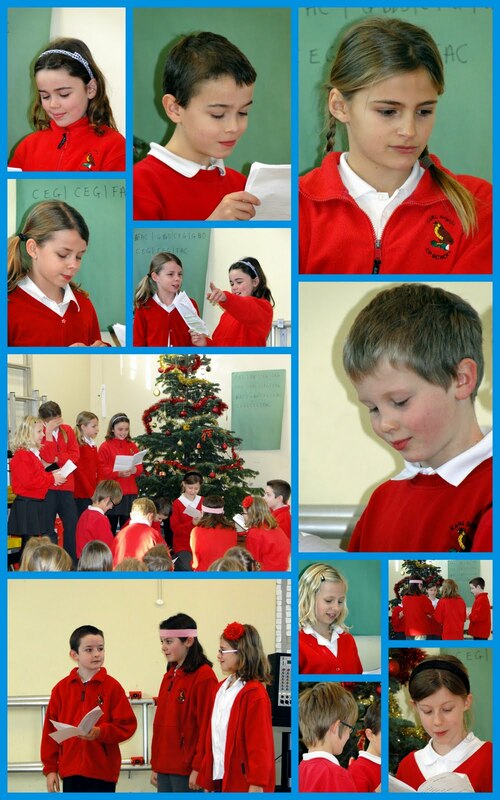 Wishing everyone, everywhere, a very 'Merry Christmas' from all at Earl Soham Community Primary School. 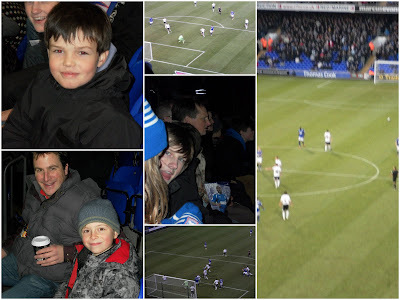 This afternoon saw the final event of this year's school calendar... a trip to the football. There were a total of 20 in the Earl Soham party, in amongst an official attendance of 17,256. 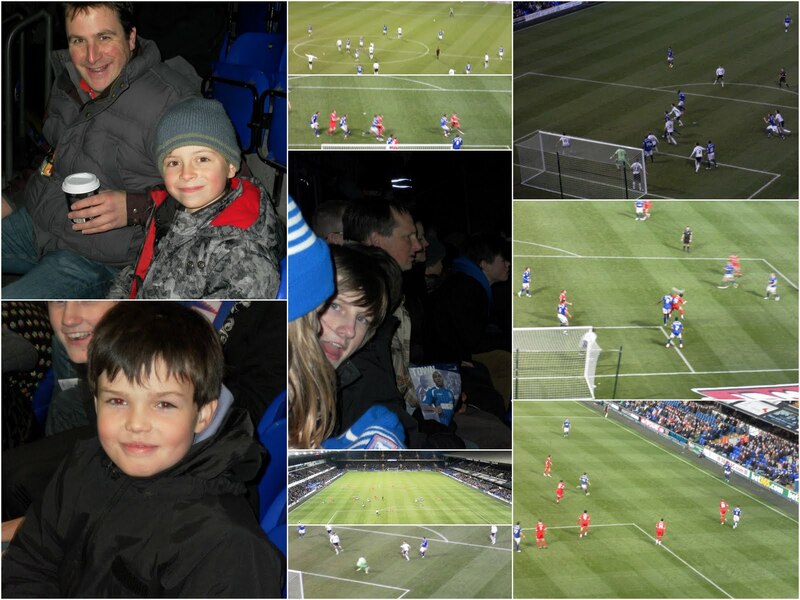 Whilst it wasn't the most stimulating of matches, a 1 - 0 victory for the home side saw most fans go home happy. The goal, which came courtesy of Keith Andrews early in the second half, in many ways summed up the whole match...rather confused and unsure. This is the 3rd match of the season that we have attended so far, witnessing 2 wins and a defeat very much in the style of one of the best westerns ever - The Good, the Bad and the Ugly! Just how much more can happen this week!? 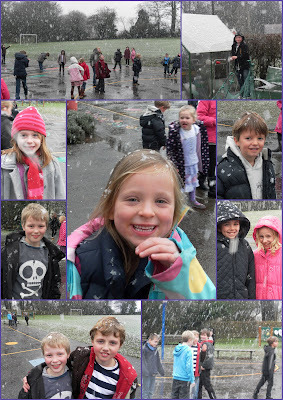 At the end of this morning's 'karaoke' Christmas, much excitement was in the air as the first few flakes of snow descended. By lunchtime, the earlier 'wet' snow had turned into rather large flakes. It seemed too good an opportunity to miss, so those that wanted to had five minutes fresh air. Rosy cheeks and broad smiles in abundance. 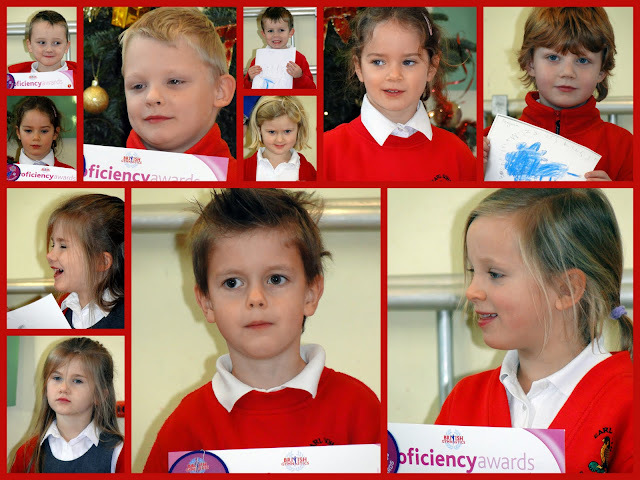 The annual Christmas party, funded and organised by our wonderful PTFA, was soon in full swing this afternoon. 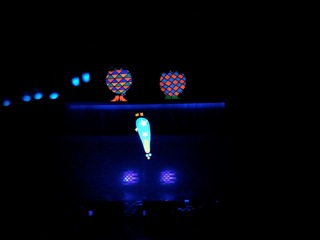 The children (and staff) enjoyed dancing and singing along to a great set of tunes at the disco, and enjoyed an array of crisps, cakes and drinks. 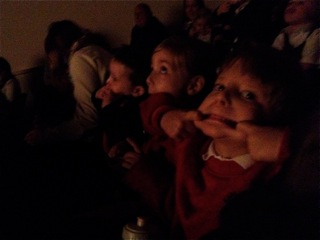 ...& the children adored the snow machine. 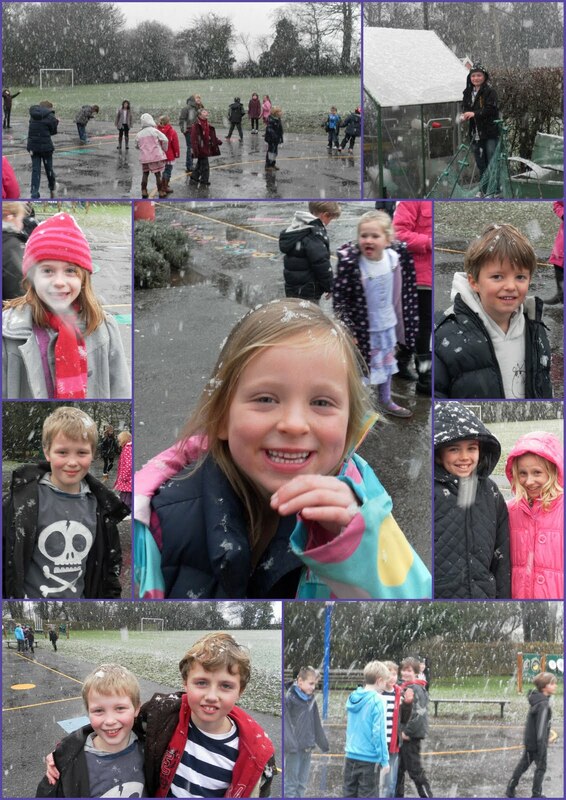 Everyone had a fantastic afternoon. A very big thank you to the PTFA for organising and paying for the disco and food. 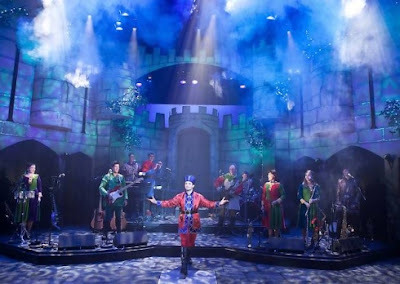 This afternoon, children in Year 2 - 6 went to see a fantastic performance of 'Robin Hood and the Babes in the Wood' at the Wolsey Theatre in Ipswich. 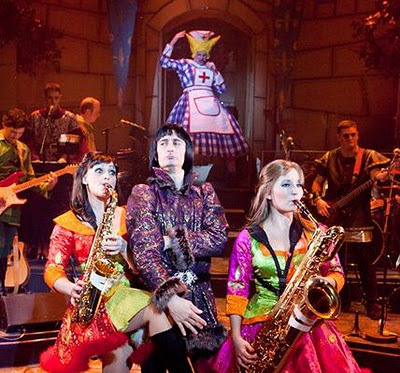 This traditional annual trip to see the Rock 'n' Roll Pantomime was yet again tremendous fun. 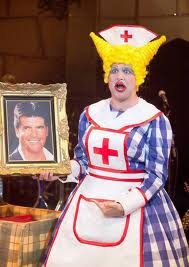 It was a truly great afternoon with plenty of singing, dancing, innuendo, double entendres, slapstick and laughter. How we cheered brave Robin Hood and booed the nasty (or maybe just misunderstood) Sheriff of Nottingham. However, the highlight for all connected with Earl Soham was how the pantomime 'dame' (Nelly) took a shine to our very own Mr Mansell - and didn't he just love it! Yet again, the children were a joy to take out and it was great to see them enjoying themselves so much. Thank you to the PTFA for funding the transport. 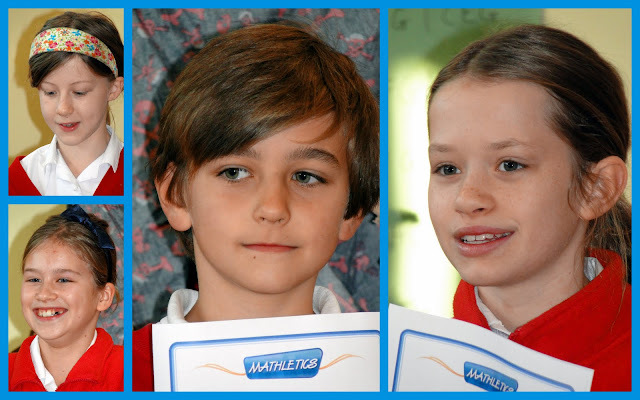 On Tuesday afternoon, the children took their seats for the big event of the year: the Talent Show. On offer this year were a range of talents - singing and dancing, playing instruments, comedy, impressions and even a Zumba Fitness workout routine. Below are some of the highlights of the afternoon. Yesterday lunchtime we enjoyed a wonderful Christmas dinner prepared by our fantastic school cook, Caroline. 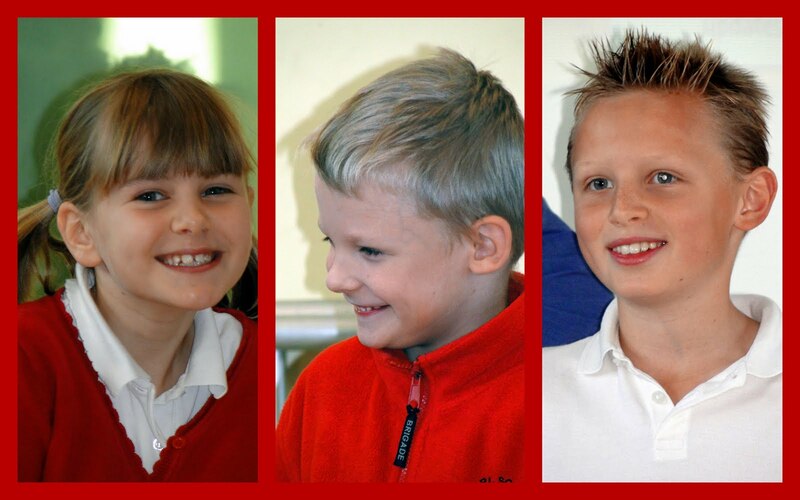 There was a great atmosphere as the children sat down in the hall and were joined by staff and governors. Blue class had been busy preparing crackers, hats and favour boxes for the tables, which lent a particularly festive feel to the occasion. The year six children, ably accompanied by our midday supervisors and Mr Pearce (who looked rather fetching in his Turkey hat! ), served and waited tables. We all had plenty to eat, with enough food for seconds. Thank you to Caroline for the hard work cooking it all, Tracey for peeling the mountain of potatoes and James, Katie and Charlotte for setting up and clearing away all the chairs, tables, crockery and cutlery. We hope you enjoy the photos, which I think show just how much everyone enjoyed their meal. 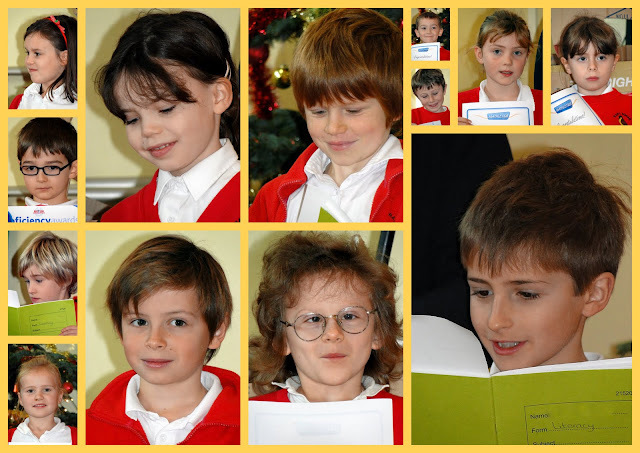 Yes, this is our 400th Blog post, and what better way to mark the occasion than by sharing with you the best bits of our school carol service. We begin with a beautiful rendition of Away in a Manger, with the first verse sung by Red Class, and all classes singing verses 2 and 3. Next is the heart-warming, if rather high, Hark the Herald Angels Sing, sung by the whole congregation. 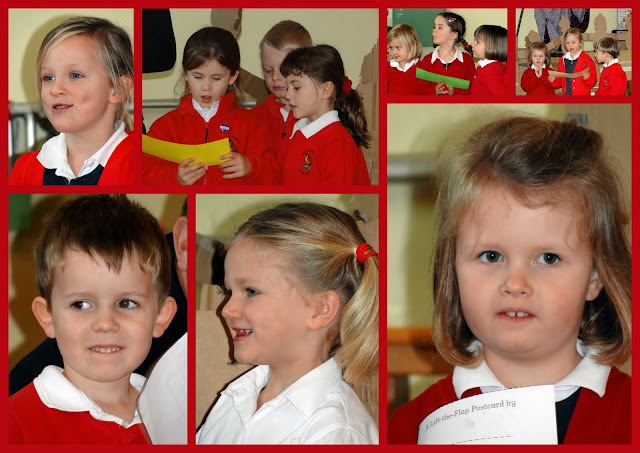 This is followed by two songs from the School Choir: Snow Song and White Christmas. 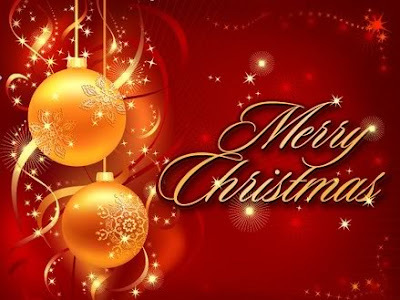 I would like to post the Staff Choir's 12 Pains of Christmas here too, but don't have any photographs. If you happened to take a shot or two, please email them to me at jamesmansell@earlsoham.suffolk.sch.uk and I will add them to the blog. Since this post is a rather special milestone, we would really like it if you could take a moment to leave us a comment and let us know what you think of our blog. Whether you have commented before, or are completely new to it, we would love to hear what you thought of the carol service (if you were there), or what you like most about our school blog. It's really easy to leave a comment - just visit the blog and click the comment button. You can leave a post anonymously, or sign in and leave your name. 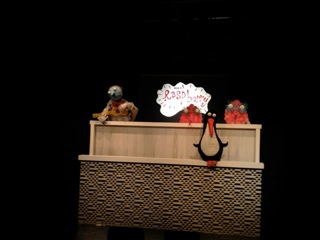 This morning, Red Class visited the Wolsey Studio in Ipswich to see a performance of 'Penguin' by Long Nose Puppets. The show was based on the book by Polly Dunbar where a young boy (Ben) receives a penguin as a present. 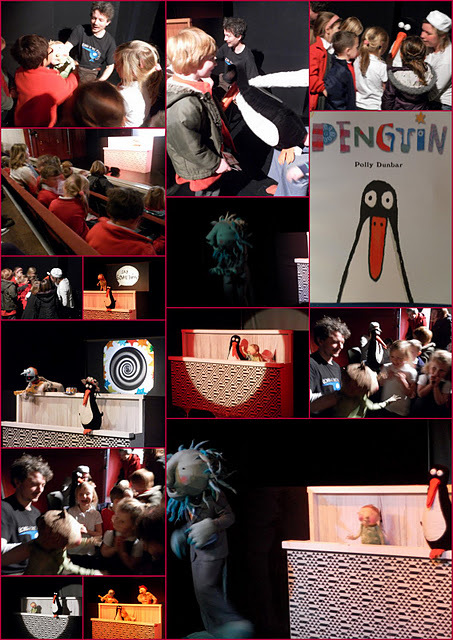 Unfortunately, nothing seems to make the penguin talk - even some audience participation in singing, blowing 'raspberries' and pulling silly faces didn't help! 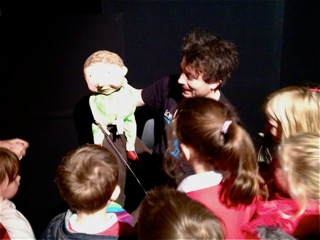 The children had a great time interacting with the puppets, which they got to meet at the end of the show. 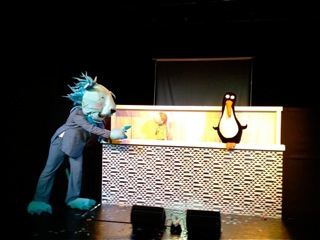 There were gasps when Ben was eaten by a passing lion, followed by laughter when the penguin bit the lion on the nose and made him 'cough up' Ben. 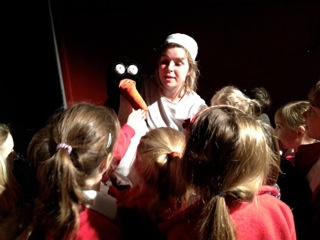 Read Class, you were fantastic - we hope that you enjoyed the show as much as the adults! The pirate ship has been sunk! Red class this afternoon received another letter - a cry for help from Sweep! 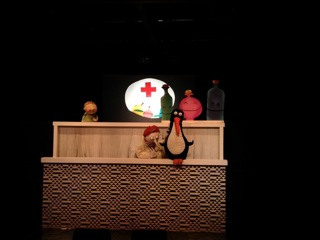 It was addressed to the Red Rescuers ( if you recall they rescued the mermaid earlier in the week), but they needed to enlist the help of Yellow Class and Jennie ( because she was the tallest) for the mission to succeed. They had to teach the pirate dance to Yellow Class, then we all had to do it together! Chaos - but mission accomplished - Sweep was rescued and returned safe and sound to Mr Pearce. The ship sadly floundered in the storm - and is no more. Sweep stuck at the top of the mast! 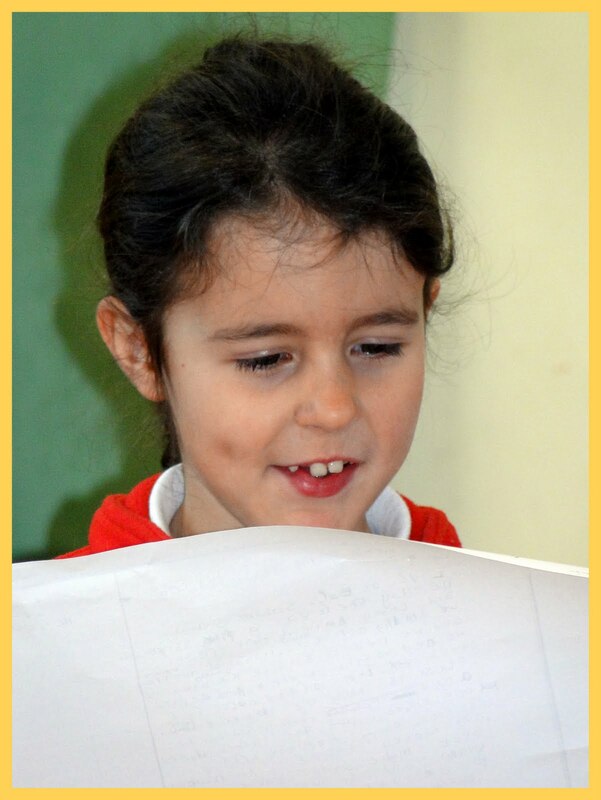 Yellow class investigators have been chasing around all morning looking for clues and trying to decipher the map. They are looking for a mysterious 'x' . We will bring you more information on the early evening bulletin.